Lion Cubs are alive in Northern Star Council! 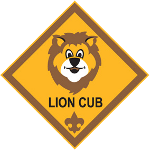 Lion Cubs are kindergarten boys just starting on the Boy Scout Trail. A boy and his adult partner get to do fun, age-appropriate activities - sounding much like the original Tiger program. By adding this program, the BSA provides a K-12 experience, dropping the entry age a bit more. You can read more about the new program at this council page. There is information for Pack Lion Cub Coordinator and a Program Kickoff Flyer. I look forward to this program expanding nationally since I often receive emails asking about getting kindergarten boys signed up. Then, I won't have to say, "Wait a year or move to Minnesota." 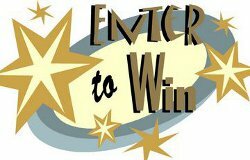 Just a quick reminder that today's the last chance to enter to win the monthly prizes - $25 Scout Shop gift card or $50 Class B coupon. Tomorrow morning, two random winners will be selected, maybe it will be you. In other exciting news, I got three volunteers to help with next month's Intro to Outdoor Leader Skills training. Now, Northern Tier, Philmont, and Sea Base all have similar sites - but I bet Sea Base will be redone soon to match the other two more closely. Summer, Fall, or dead of Winter, the north woods of Minnesota are a place of adventure. Canoe treks or Okpik winter camping, it's up to you. 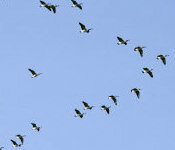 On my hike this morning, I saw my first goose formation practicing for migration. It's still early, but I guess the cool morning got them thinking it's time to start preparing. They know that they don't just take off one day and head South. They build their skills and muscles and then, when the time is right, they go for it. Being able to look ahead and prepare now for a future challenge is a great skill for scouts and one that tends to be lacking in guys their age. If a Philmont trek is scheduled for 2012, making a gear list now in time for Christmas :-) is a good idea. Planning out a few merit badges to do over the winter, figuring when to tackle First Class cooking, camping enough nights for OA are all examples of looking past today and planning. There are many such opportunities in Scouting. In 2005, Northern Star council was created by merging Indianhead council and Viking council. There have been many other council mergers over the past decade and the trend to restructure due to economics, member levels, and demographics continues. Knowing what your neighbors are doing is usually a good way to be prepared for change. In Michigan, the 11 councils in Area 2 are on the brink of a complete overhaul which I find interesting to read about at their Area Project website. They've posted tons of information and data that should certainly be useful for any other councils facing restructuring in the future. I appreciate their volunteers for putting in the extra effort to share their process with the rest of us and wish them the best of luck with implementing their changes to improve Scouting in Michigan. Did you get your Sept/Oct Scouting magazine yet? Take a look at page 24! We don't always stop at Dairy Queen on our hikes, but we do use gmap-pedometer.com a lot and it works pretty slick. That page is a good indication of what I plan to do for the next few years now that I'm not wearing the Scoutmaster patch. From the initial research I've done, there's no camping nor connecting routes for the last three and thru-hiking them isn't really a probability. 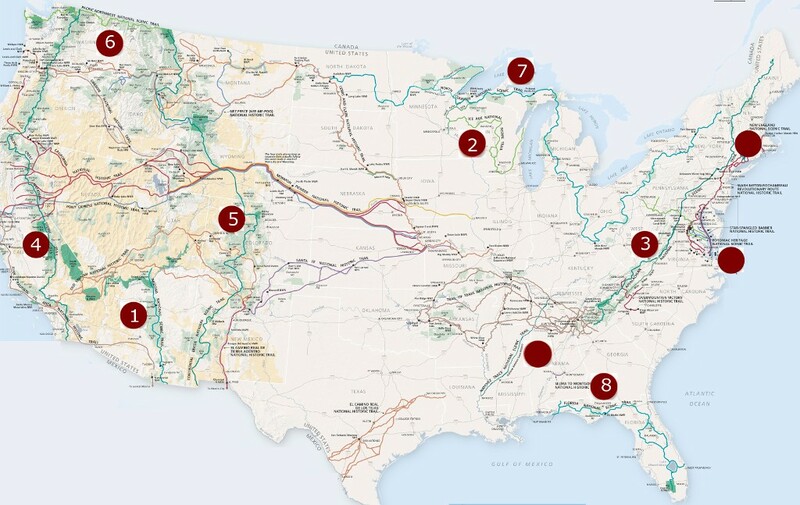 I plan to hike the first 8 in the order listed, starting in Spring, 2012. If I'm wrong about the others, I'll add them. The AZT is shorter and requires hiking early in the season since water is scarce and heat is intense as summer approaches. It will give me a great opportunity to test out my equipment, abilities, endurance, and processes. If it goes well, then I'll do the IAT in late summer, 2012. This lets me be home for my last son's high school graduation and shipping off to college. After that, it'll be a trail a year. As an initial plan, I'll do the Appalachian Trail in 2013, hopefully working it so I can drop in at the Jamboree at the Summit - it's only 50 miles off the AT in West Virginia. But, at this point, I'm not set on the order of the trails. Connect with scouts - I'll invite scout troops along my treks to come out and hike with me for a couple hours or days. I'll have a tracking device so folks can see where I am. Promote lighter-weight trekking. When we try to "Be Prepared" I think we overpack and make life more difficult than needed on the trail. I'll be an example of how to be light and safe. Promote Scouting - I'd like to represent the BSA on the hikes and talk it up to folks I meet. Record the Fun - through blogs, reports, stories, and journals I'll track and share the experience, hopefully providing a resource to help others. I've gotten the Atlas and Guide for the Ice Age Trail and have developed an itinerary. The Arizona Trail books are in the mail so I'm really excited to start planning that one out. I'm walking about 8 or 10 miles each morning to keep the joints moving. My next part of the project is acquiring and testing gear. Next week will be my first free Monday night in over six years - no PLC meeting, no troop meeting, no committee meeting, no merit badges or patrols to visit. Now that the new Scoutmaster is trained and guiding the troop, I'm on my own. I've got some big plans, but first I'm curious to hear from you guys. What role does the past Scoutmaster play in your troop? 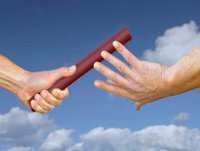 - leave a comment about how your troop puts the ex-SM 'out to pasture'. Is it a clean break, becomes an ASM, joins the committee, or something else? We've decided that it would be best for the scouts to have me away from meetings and campouts for at least six months. This is to engrain in them that I'm not the scoutmaster now. My transition falls in nicely with a new SPL election this coming month so the entire troop leadership will start anew over this next month. Merit badge counselor for anyone in the council, including the troop. District training volunteer for SM Specific, IOLS, and Youth Protection. High Adventure planning resource to all troops in the community that need advice on their treks. Complete two website projects I've neglected for the past few years. Present Red Cross CPR/AED and WRFA training, mostly to scout units. I figure that should keep me pretty busy and active enough in the Scouting community. But, it doesn't really get me out into the wilds as much as I'm used to and as much as I'd like. I've got a plan for that part of my life that I think will keep me busy for the next six years. Stop by tomorrow if you're curious. Here's a clue - I hiked 11 miles this morning. Every day is a transition. Scouting volunteers are rewarded with seeing an ongoing transition in the scouts over months and years as they learn skills, push their leadership skills, and outgrow pants. Sometimes these transitions are gradual and sometimes instantaneous. Last night the troop had a 'retirement' picnic for me. A new Scoutmaster is guiding the troop now. He's an Eagle Scout and a terrific guy with a 2nd Class scout son in the troop, so he'll do an awesome job. I started looking for someone 10 months ago and we've had a 6-month transition time so he's ready to go. We spent a week at summer camp together where a lot of traditions, ideas, and "things I never got to" were shared. I've given him a DVD packed with planning and program documents from past high adventures, weekend campouts, fundraising, joining, advancement, and training. He's got everything I could think of to pass on and a fresh view so the troop will continue to thrive under his direction. My involvement in the troop will be only as a merit badge counselor now. I figure it's best to have me away from troop meetings and campouts so there's no temptation to look to me for advice and no confusion about who's the scoutmaster. The troop presented me with a custom walking stick from MsSticks.com and it's beautiful. If you're looking for a unique gift for a scout or scouter, check her site out. We finished the 20 mile hike at 3:45 after starting at 8:40 this morning. Two scouts set the pace and I just had to keep up. It was a great hike, exploring a few new places around the community, and the weather was terrific. 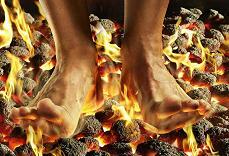 And, actually, my feet and legs feel just fine - tired but fine. Someone asked if we do anything special for a 20-mile hike. Not really. Everyone has water bottles. The scout laying out the hike shows me where water locations are and reassures me that we are on trails or sidewalks the whole way. I ask to borrow some sunscreen to make sure we have some, and then we're off. The scouts use GMap-Pedometer to lay out their hikes - it does a great job and they can share the map with everyone. On this hike, we stopped at Subway at 8 miles. The scouts got footlongs, but I just did a 6-inch BMT with everything but tomatoes. Did you know the "BMT" is named for the Boston Mass Transit? The scouts did a lot of guessing before giving up on that one. It was a scruptious meal and enough to fuel the engine another 12 miles. We had two more water stops after that since it turned out to be sunny and 83 all day - a great day for hiking. I also asked how feet and legs felt a couple times but these guys are in great shape with baseball, tennis, and basketball all the time. I love it when a scout figures out that he needs to take responsibility for completing merit badges and rank requirements. Sometimes, scouts can have a path of badges required to advance through Star, Life, and Eagle laid out for them by the troop, offering badges in a cycle. This requires very little of the scout - sign up, show up and participate, get the badge. When a scout wants a merit badge, it is so much more fun. He sets up meetings with the counselor, plans his requirement completions, and pushes to get things done. He is stepping out to engage adults rather than being pulled along with a group. I've got a First Class scout anxious to reach Star before the September court of honor. He has just two merit badges to finish. Since he started Hiking in the spring to prepare for his Philmont trek, he's decided to complete that one. He's arranged two hikes and we're doing his 20-miler today. On the last hike, we finished up the first aid and 'discussion' requirements. Today, it's just hiking around with a couple buddies - and lunch at Subway! See you in 7 hours. Troop 198 scouts put out a small brush fire in Oregon. Great to see them have the SPL do most of the interview! It would be interesting to hear who started the fire. A faulty camping stove doesn't just start a fire - it must have been lit by someone. Maybe more details will come out about this one. Our troop rafted the Deschutes a couple years ago and it was a ton of fun. Nothing better than cool water on a hot sunny day- except rushing water! The regional path was very busy today. I passed about 12 joggers, 9 bikers, and 4 or 5 walkers as I put in my 8 miles and I waved to each one of them. After all, the path is only about 8 feet wide and it's just polite to say "Howdy". About 75% of those people had wires hanging out of their ears, listening to some music or reading. Is that good, bad, or irrelevant? I understand that music makes the exercise routine less boring and helps the miles fly by faster. It adds a bit of entertainment to an activity that many don't enjoy. But, the dangers of being plugged in and tuned out are real. Last year, pedestrian deaths rose for the first time in four years. Electronic devices are the blame. Runners, walkers, and bikers jamming to their tunes instead of paying attention to traffic get hit. Even on nonmotorized trails, being tuned out increases the risk of harm. Not hearing the "On your Left" warning of a biker overtaking you can cause a collision. Sound perception researchers say that music affects your thought process. As you attune to the tempo, you may be able to run more easily, but you aren't noticing branches, rocks, curbs, and other obstacles as you should. Your brain tunes out the world as you daydream along which could cause a rude awakening. My biggest concern with personalized music devices is that the majority of the people using them don't make the effort to say "Hi" back to me. I'm not a bad guy. I smile at them. I raise my hand in greeting. But some just plod along, in step with Justin Beiber or AC/DC, I don't know. This morning, they didn't hear the red-wing blackbird, the cardinal, the movings of some small critter in the brush, or the splash in the lake. They didn't notice the two young deer chasing each other in the field, the squirrel skittering up the oak, or the far-off turkey. I did, and I loved every sound. Another week of summer camp is in the history books. Eleven scouts and three adults had a terrific time in the great north woods. Few mosquitos, lots of sun, low humidity, great program, and a super staff made for many memories. Weather makes a big difference in the 'fun factor'. While we had record heat and humidity as well as severe storms the first week, this time it was beautiful nearly every day. While weather plays a part, the group size has an even larger impact. As you can see in the photo, our first week group was 4x as large as the second week. 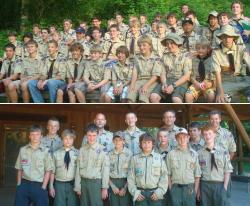 This week was the first time at camp for most of the scouts. They had missed previous years because of baseball or other conflicts. This group of eleven worked well together because each scout was needed and there was work for everyone. They couldn't just sit and not be noticed. They all completed their merit badge projects and kept a clean campsite. Three scouts got to fill the role of SPL at some point during the week as some program elements took scouts away from camp. The SPL was gone an afternoon to shoot black powder rifles so the ASPL stepped up. Then, the SPL and ASPL went on an offsite overnight adventure so a Tenderfoot ran camp until breakfast the next day. The only time that our small size was a hinderance was trying to play water polo, but a couple staff members and two adults helped fill the teams. Other than that, having fewer scouts meant more shooting, more climbing, and more sailing for each scout. Even though we were the smallest troop at camp, the SPL volunteered his guys to clean the dining hall 4 times while most other troops did it only 1 time. He saw the need and provided the service - that was great to see.